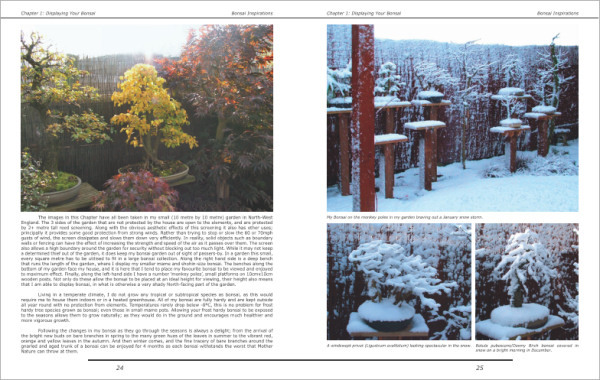 The first book from Bonsai4me, 'Bonsai Inspirations' has been re-designed, edited and re-printed after an absence of 2 years. Just a quick note to say that I received your book on Friday - and it's a breath of fresh air. No elitism. No pretentiousness. No 'woo-wooism' ! Just serious practical, sensible, and factual advice that we can understand and learn from. Best of all none of the 'I imported this tree from (insert name of famous Japanese nursery) along with a few others (all costing sums that would pay my Winter fuel bill for the next 5 years)', accompanied by some glossy photos of trees that most of us can only dream about, and in a landscaped 'garden' I would call a field. There are a few on the 'WeeTrees' forum that advise the rest of us to seek guidance from your website. Thanks to them I do just that. 25 years as a bonsai fan, and at last I've found someone who doesn't sound like a 'superior being' who can only talk down to us." 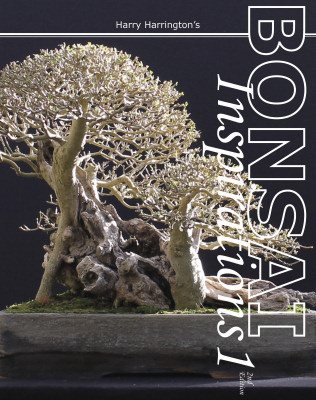 "In a world filled with opinions and rules diverse as the species used, there is finally a book to fill a sorely apparent void in the bonsai universe. 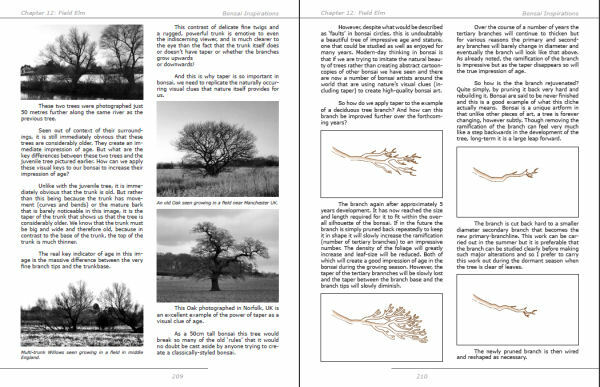 Harry Harrington has transformed and extended upon his brilliant reference website (bonsai4me.com) into that book. If I were limited to two words to describe it, those words would be "eminently practical". That may sound trite, however the book is anything but. Harrington espouses the use of readily available, native species. To these are applied tested, proven, and appropriately-timed techniques. The reasoning and results are clearly demonstrated in diagrams and photographs. The text spends little time debating the merits of particular styles, but instead provides all the information (and then some) required to accomplish transforming the vision of the tree in your mind to that of a tree in front of you. As the owner of well over 50 English and Japanese books on the subject along with hundreds of English and Japanese magazines, I am fairly comfortable saying that this is the first book I have seen give the tools, rather than cookie-cutter recipes or simply glossing over the key bits. 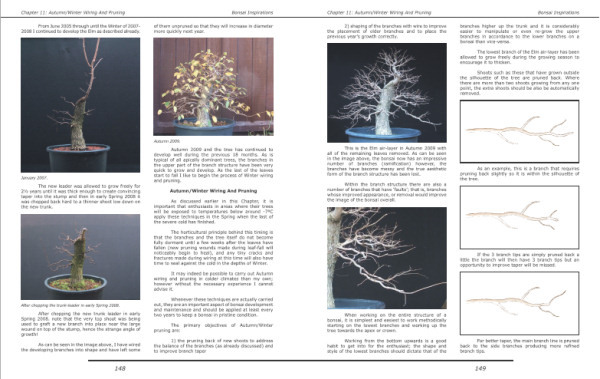 Buy this book, regardless of your skill or experience level in bonsai. The only way not to learn something from it is to not open it." i've received your book and already read it. what a wonderful work. "My copy just arrived today. I've barely skimmed through it and it looks amazing. A lot bigger then I thought it would be. Great deal. Thanks so much Harry." "I received your book a few minutes ago in my home here in Brazil. Looking quickly inside the book, I can see that it's spectacular!!!!! Very clear, colorful, many pictures... and much knowledge that will make my bonsai work better!!!!" "got my book on tuesday, cant put it down, thanks Harry. When finished going on top shelf in front of koreshoff and both of john nakas books. Learnt some things in the last three days I didn't know"
"I received your book a few minutes ago in my home here in Brazil. Looking quickly inside the book, I could see that its spectacular!!!!! Very clear, colorful, many pictures... and much knowledge that certainly will make me better at bonsai!!!! "a really informative, well presented book. A lot of people are gonna learn a lot from this. 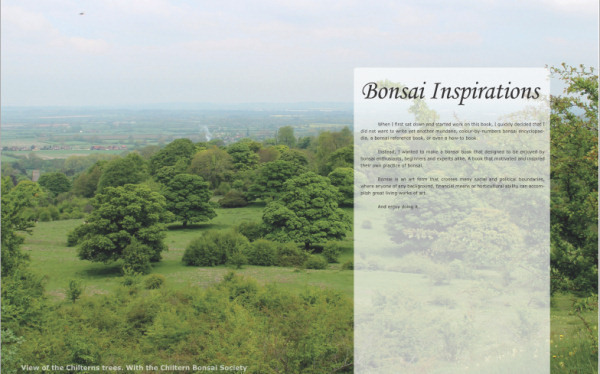 In conjunction with the website, there is almost all you are likely to need to know about about bonsai. A really good read and reference publication." 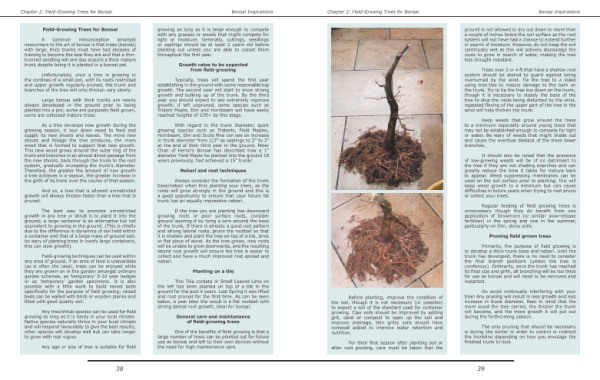 "I have hundreds of bonsai books and magazines in my collection and was doubtful if adding another was required. Having known Harry from the old IBC years ago and being a lover and user of his website www.bonsai4me.com, I decided to give it a look................This proved to be a wise move. 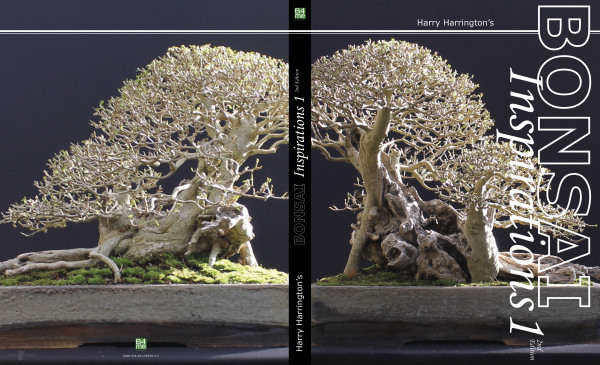 It is like no other bonsai book in my collection and shows Harry’s trees progressing over the last 10+ years. Chapters on developing and creating bonsai from Yamadori, garden plants, and semi established bonsai are very well thought out and the use of hundreds of colour photographs makes this a beautiful book to read. Well worth the money." "It is very easy and pleasant to read. 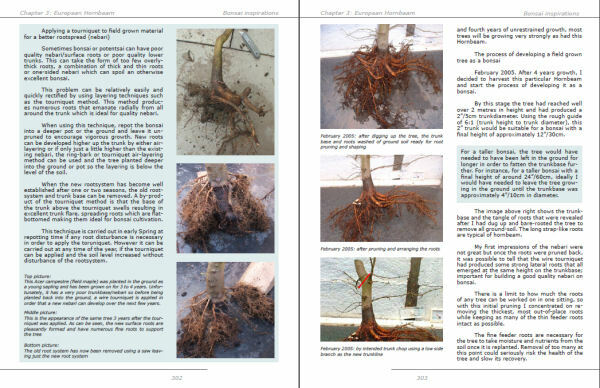 Although it does not cover the very basics of bonsai cultivation, which I find very attractive – there are many other publications covering this area, it is definitely a book-to-have for all bonsai enthusiasts"
"My first impressions of the book are very positive. I haven’t found a book similar to this in style and content for a long time. At 267 pages, it’s a lot bigger than I expected.......The amount of photographs is staggering"
"The book is very good indeed - clear, logical and accessible - and only touches on the mass of material that HH must have at his disposal. I've only been able to skim it over a very busy weekend but what I particularly like is the way HH works the description of individual development techniques into each tree's story very neatly."